Perfect for festivals, weddings, family reunions and corporate events, our 40’ Wide Pole Tents stand out from the crowd! 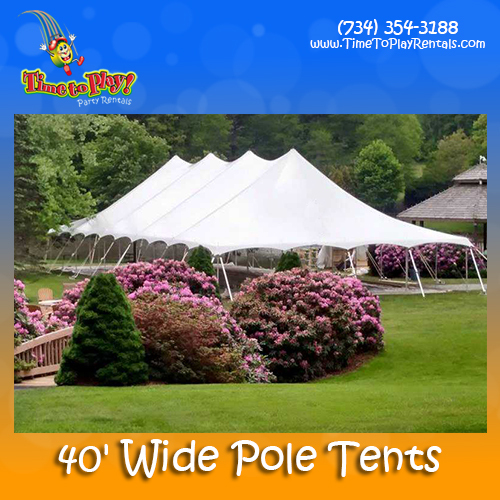 With tall center poles creating a high peak look and beautiful bat-wing valances, these gorgeous tents will provide sustained coverage from the elements while allowing you to create the event of your dreams! Add solid or French-window sidewalls for privacy and protection from weather, as well as tent heaters for additional warmth. Our Pole Tents are most suitable for grass set-up; they cannot be installed on cement. Seating allowances for 40’ wide pole tents start at 120 with our 40’ x 40’ tent, and increase with our 40’ x 60’ 40’ x 80’, 40’ x 100’ and 40’ x 120’ tents. We would be happy to work with you to determine the most appropriate tent size and seating arrangement for your event.